General Description: It is a submerged aquatic plant and has emergent and submersed leaves. It is occasionally found on mud banks. Long rhizomes and stems intertwine to form dense mats. Stems grow to 16 feet long. Flower Description: Flowers are inconspicuous and white in leaf axils of submerged stems. Leaf Description: Leaves are feather-like and arranged in whorls of 4 to 6 leaves. Emergent leaves are bright green and look similar to little fir trees. Submersed leaves are darker. Stem Description: Emergent stems can grow up to a foot out of the water. Submersed stems may grow up to 16 feet long. 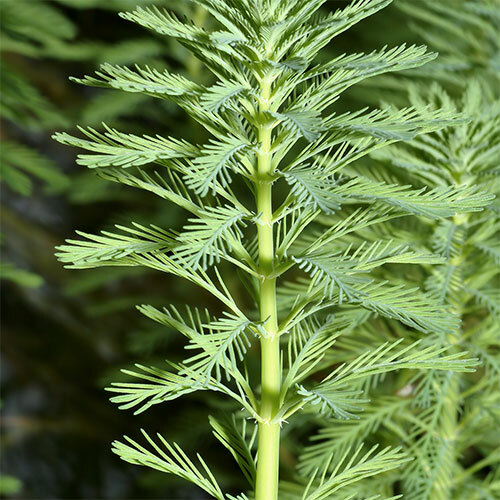 Parrotfeather is an ornamental aquatic plant that has escaped cultivation. Infestations can alter aquatic ecosystems. It forms dense mats that shade out other native aquatic plants as well as inhibit water flow and recreational activities.